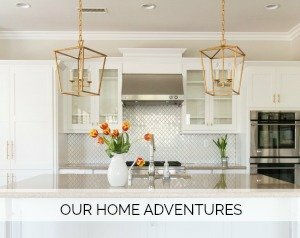 Welcome to our new home tour! I have been really excited to show you around. Truth be told we have just be in the thick of things and it’s taken me this long to unload the photos from my camera. Today I want to show you around the downstairs. Our forever home just feels so right to us. And I was really excited to hear from the previous owners. Such a wonderful family who loved this home first and we promise to love it just as much. We are already starting to make it our own and hope you’ll follow along with us on this adventure. Welcome! I couldn’t believe my eyes when I saw all of this beautiful woodwork. It’s exactly what my husband and I love. 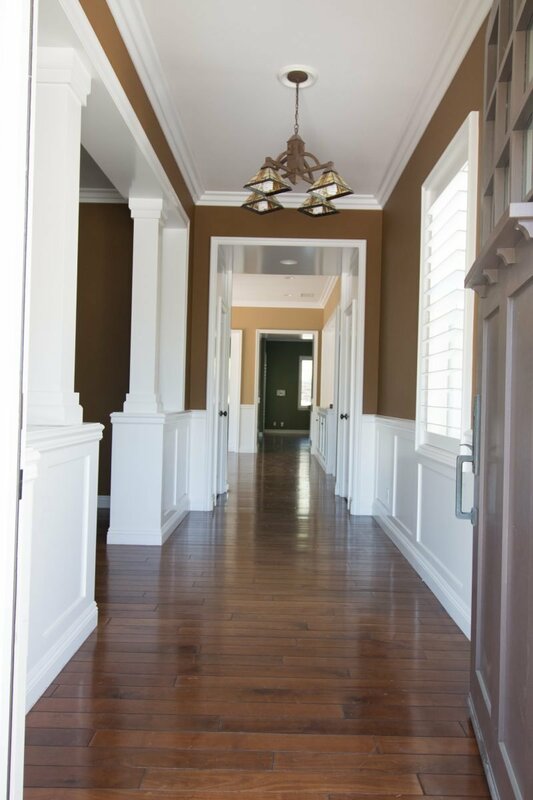 We did a great deal of that in our current home (just on a much smaller scale) and are so excited to have this pretty millwork throughout the downstairs. We are lightening the walls and going with Pale Oak (my favorite color used in our bedroom). I think it pairs nicely with the craftsman style of the home. 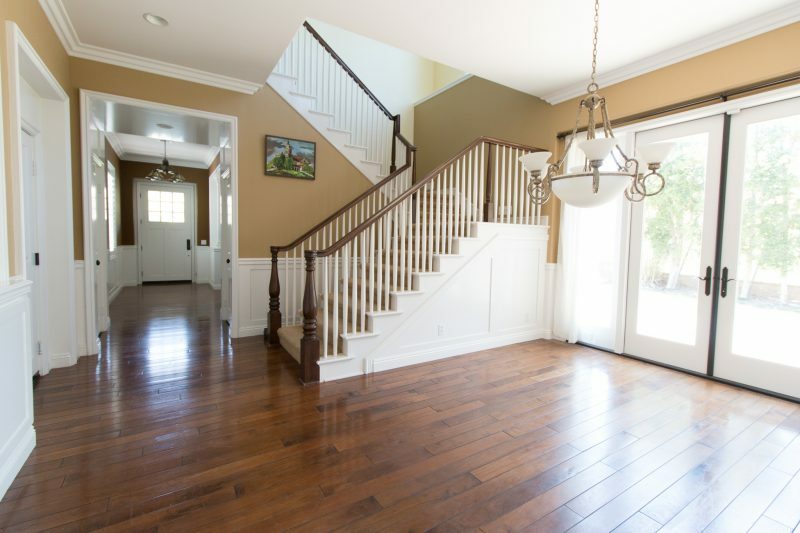 There is a formal space off of the foyer that could be used as an office or a living room. We plan to use this as a sitting room and one day hope to have a piano in here since the kids and I play. We also envision this being our Christmas tree room so we can see the tree from our front porch. Can you tell I am getting ahead of myself?! 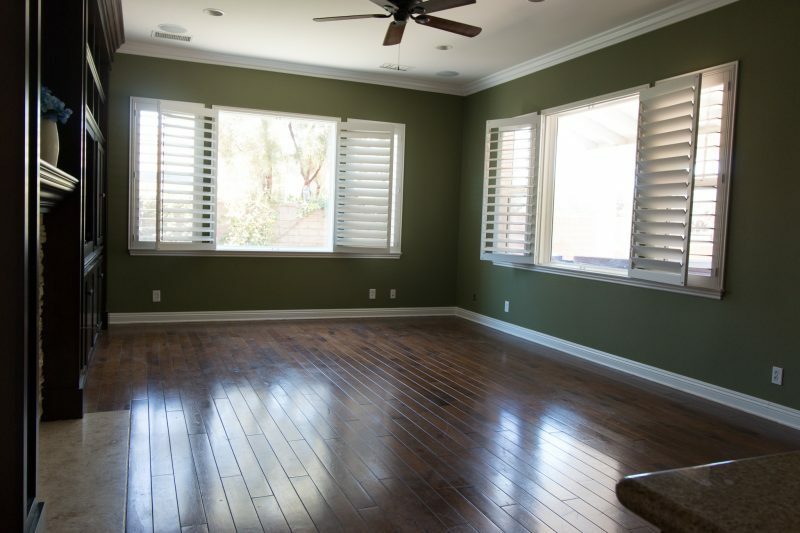 We are also so very lucky that the owners chose these beautiful floors and plantation shutters. And yes, the shop vac is my very favorite thing on the planet right now! I seriously LOVE my shop vac. And the very first night we had the keys, the kids played Life on a beach towel in this room. Fun memories for us down the road. Here is a shot looking back towards the entry. I love the built in bookcases. My wheels are already turning with those. 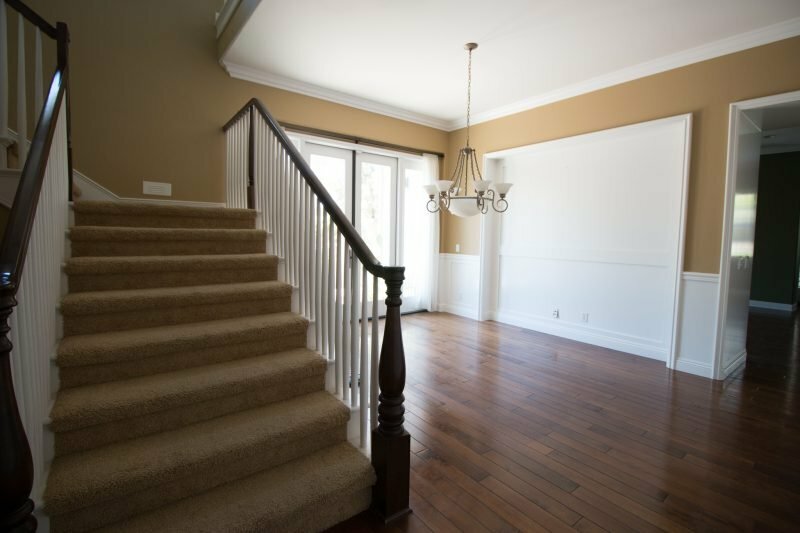 Heading in to the house, there is a pretty staircase followed by the dining room. The carpet is not in good shape (after renters lived here) and my son’s allergies will benefit from the carpet being taken out. This dining room is actually very reminiscent of ours now and so it makes it feel that much more like home. Here is a shot looking back to the front door. The doors open up onto a patio which will be great for entertaining. Something I kind of like to do from time to time. 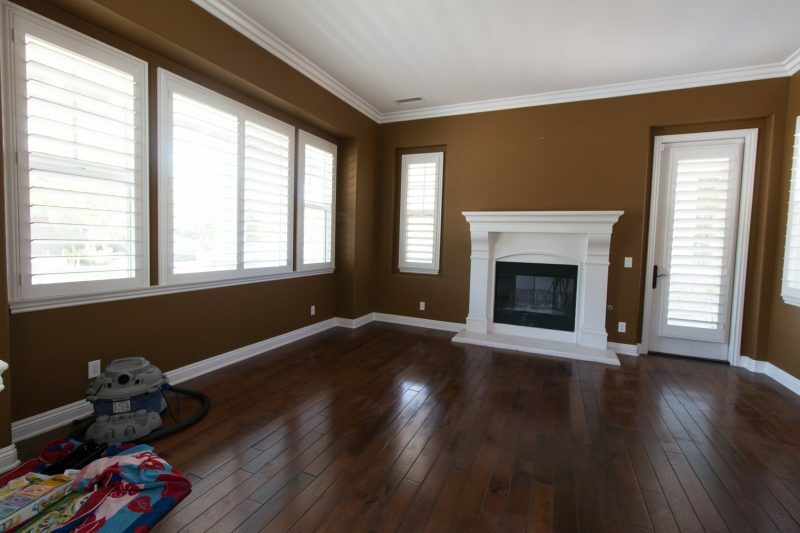 The back of the house boasts a large great room which we have always wanted. I am in love with the space and can’t wait to have family gatherings here. And while Earth tones are still the choice of many, we plan to lighten this up. We really adore all of the white woodwork in the front of the house and having the built in as well as the kitchen white will create a really cohesive look. I can’t wait to get to the point where I can have fun styling that built-in. We have never had an island before so I may or may not be doing the happy dance around it! 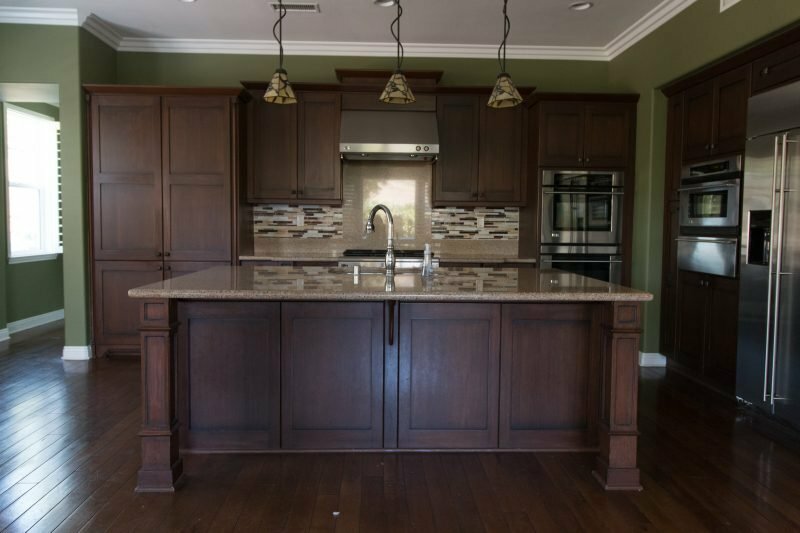 The granite counters are a warm taupe color and we will definitely keep those for now. 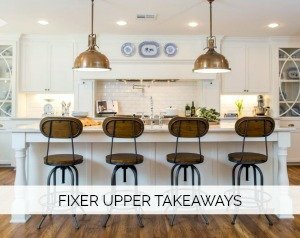 Our list really just focuses on paint and lighting fixtures. Such easy changes that will make this space feel more like our style. And here is another shot looking back. The floors are rather scratched up so any hints on that are greatly appreciated. Can’t wait to show you the progress we have already made. We took advantage of having time to have the house painted prior to moving in. I told my husband I could paint it myself and he nearly fell over. I suppose priming and painting the darker colors would have taken me longer than I thought. So stay tuned to see things brightened up a bit. We couldn’t be more excited about making this house our home. And as I said at the onset of this post, we promised the previous owners we would take good care of it and fill it with love and life just as they did. *The story of how we found this house can be found here: We’re Moving. It’s going to be beautiful!! I love all of the trim work. Your sister said it perfectly, “What were you thinking?” I could not have made an offer quickly enough. So glad it worked out for you and your family and I’m sooo excited to watch you make it your own. My sister was spot on. No question about it! Thank goodness for family. Thank you, Lori. . . looking forward to sharing this adventure! Have a wonderful week. Thanks, Natasha!!! That means a lot. I can’t wait for you to come visit. I need my Schue fix. Love you. Agree, you sister was spot on as was Riley saying “it just needs love”…well, that and a little (lot of) paint. 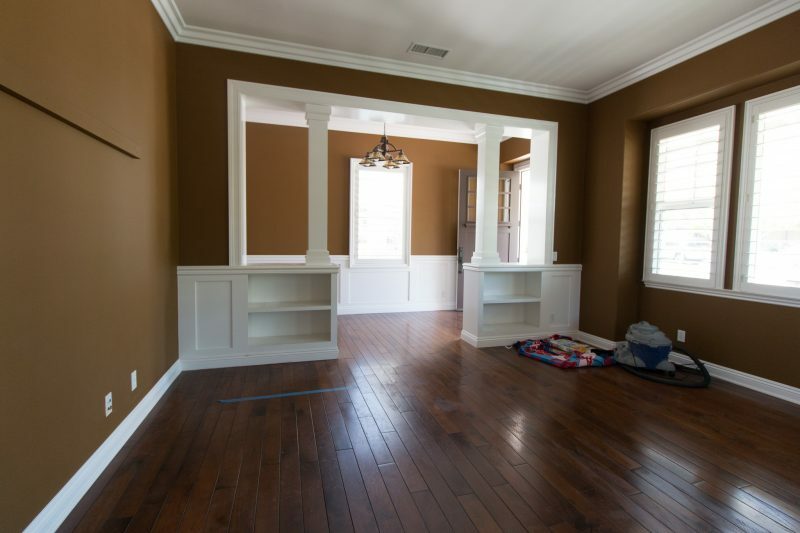 The woodwork is gorgeous and the kitchen and built ins will really shine once painted white. Cannot wait to see how you style everything. We turned our formal living room into a library/sitting room with a piano (the girls and I play, but not well LOL) and love it. We actually USE the room. As for the scratched floors, there are a couple products on the market that work fairly well. And since you aren’t in the home yet would be easy to apply as they have to dry for a good 24/48 hours before heavy furniture and traffic can be on them. I would ask the people at Home Depot or Lowes. The other option albeit messy and an expense is to have a company screen the top coat and apply a fresh one. I would go with the first as once rugs and furniture are in you probably won’t notice them as much. It’s a gorgeous home and I can’t wait to see all you do with it. It has so many great features already! Looking forward to seeing you put your stamp on the new home. Your style strikes such a nice balance of elegant and home-y. If you haven’t already sold your original home, I will say some prayers for that. We’re on our fourth house and it’s always the selling part that keeps me awake at night! Such a gorgeous home with great bones! I can’t wait to see your updates! We bought our forever home a couple of years ago and I can’t believe how much alike our homes are. 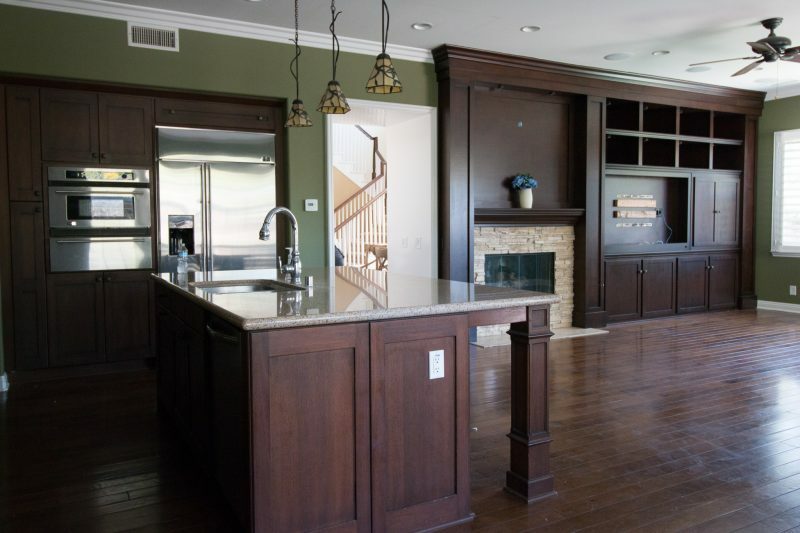 We have the same millwork and the exact same kitchen cabinets. I have been itching to paint my cabinets white, but have yet to convince my husband (he’s close). I will anxiously await your reveal to show him what a great idea it is!! OMG I’m in love and I can’t believe you even questioned putting an offer in! I can wait to see what you do with it. 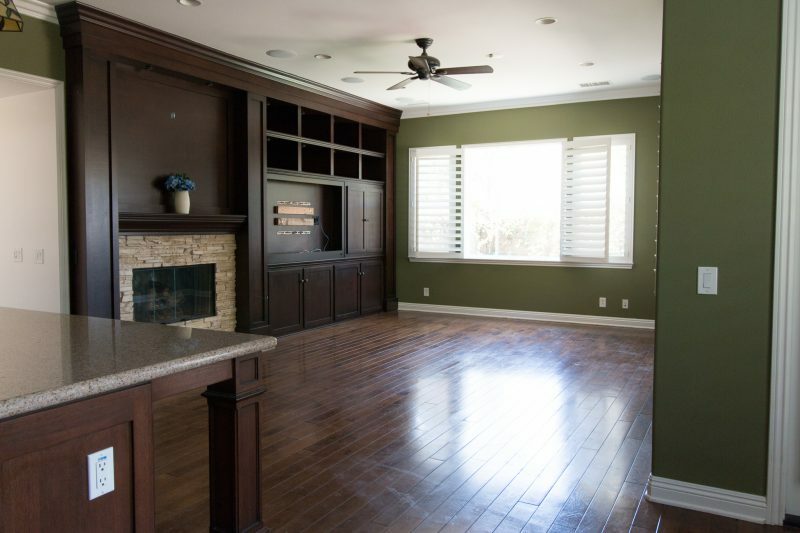 Are you keeping the kitchen dark wood or painting those cabinets as well? This house is beautiful! I can’t believe it scared you away at first. Nothing that paint can’t fix to make it more of your style. Can’t wait to see more! Your home is beautiful. I could see my family enjoying everything in it that you love so much. The woodwork is definitely a special touch throughout. I know that you will add the perfect touches to it and will make many memories that you’ll have for a lifetime. Courtney, congratulations on your forever home! It’s so beautiful but I know with your touches it will be even more gorgeous! Have fun creating your new home. I LOVE EVERYTHING ABOUT IT!!! I can not wait to see the changes you have made! I love your style in fashion as well as home decorating. I wish your family so many long and happy years and memories in your new home. Just the feeling of knowing you are “settled” gives the soul such peace. Best of luck! It will be beautiful with your style!! It already is, but you will add that special something. Your new home is beautiful, Courtney! I’m glad that you are going to lighten things up because I always think that white and light wood work better in warm climates. I know that you are going to have so much fun putting your own touch on your new home. Courtney, I am crying because you are so kind. Thank you for loving the house as much as we do. You’ve been so sweet and taking my heart into consideration when writing about your journey to your forever home. You are going to make the house beautiful beyond my imagination. Many many years from now, someone will say “if these walls could talk” we both know the walls will say that it this house was full of love. Thank you. I can’t wait to watch your magic. Between the two of us. . .so many tears! This is so beautiful, Shannon. And I agree with you whole heartedly. A house full of love and that’s all that anyone can ask for. I can’t wait to meet in person one day. Hugs to you and thank you for everything. It’s so pretty! I can’t wait to watch you personalize it and make it your family’s forever home. How exciting! It is such a beautiful home Courtney! I can just picture those doors open and a lovely gathering going on with your family and friends on the patio and your gorgeous decorations and flowers and you in one of your pretty dresses! It’s a perfect forever home for your family. Hoping to get a peek in person in September! What a gorgeous house! I’m beyond excited to see what you do with it. I’m sure I’ll be pinning all those posts too! ???? Courtney, thank you for sharing this. Your move has helped me see the hope in finding a new place to call home. I am in the process of selling my parent’s house, which has been tough in that we’ve finally decided it is not a good option for our growing family to live. Your house tour today helped me to see that a home is about the loved ones who live there and how you make it your own. Thanks again for inadvertently giving me encouragement! God bless your family and praying for a smooth transition for your move! It’s beautiful. Congratulations! 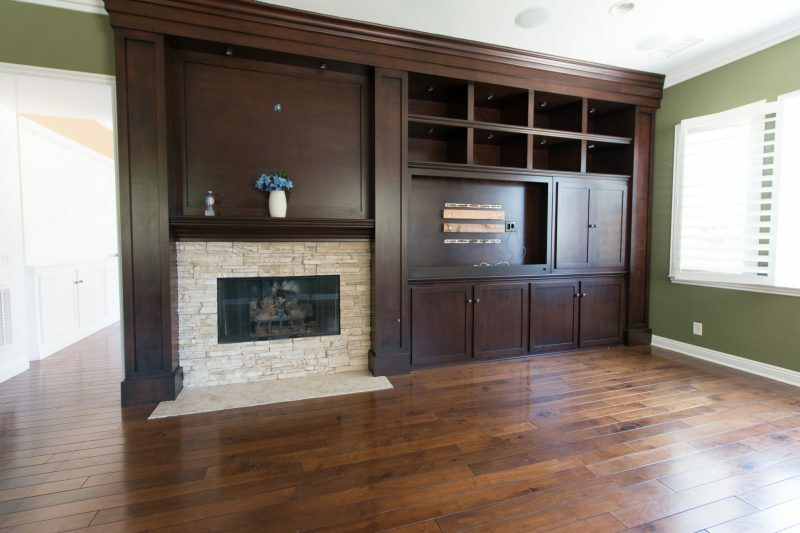 I love all the woodwork, but definitely agree a lighter color would do wonders for the spaces. That’s what we will be doing next summer – lightening the main floor from greens and browns to light and bright; along with a small scale kitchen renovation. I’m excited to see what you do. I loved the look of your last house. This house is beautiful! I agree that painting the built-ins and kitchen will tie in really well with the existing woodwork and will really brighten things up, but maybe consider keeping the island wood. It’ll keep some warmth and heft in the space. 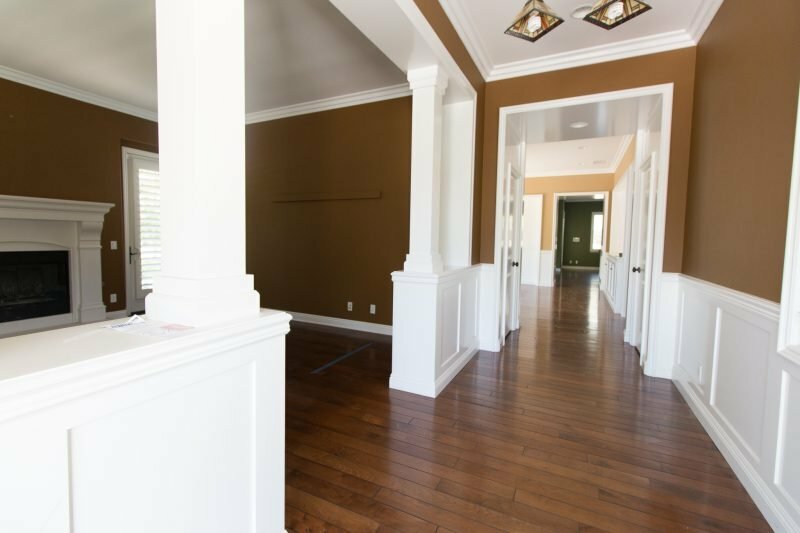 I can’t wait to see how you personalize this house! Congrats! Is that a warming drawer I see in the kitchen? AND double ovens? LOVE!!! Can’t wait to see how you make it your own. Wow, Courtney!! This home is gorgeous!! Congratulations. Enjoy this time. What wonderful memories you will make. And that dining room is so much like your previous home!! Your furniture will fit in beautifully. Meant to be!! I am so excited for you and I can’t wait to see pics of how you decorate!!! It must feel so good to have found your forever home! Looks lovely! Can’t wait to see you work your magic and hopefully see it in person soon!! Can’t wait to see more of this translation as you move forward. Yay!! ???? Congrats on the new home, great essentials to work with here, your updates are making a huge difference! Enjoy!